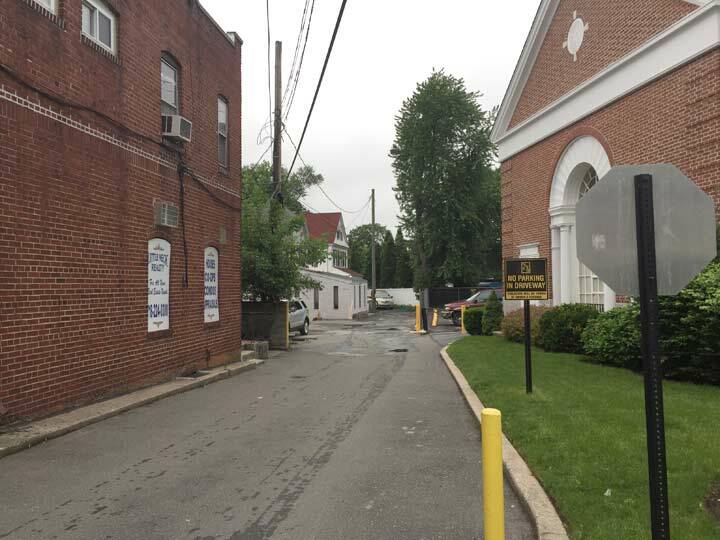 Jessie Court is a dead-end on Northern Boulevard on the north side of the street where it meets Browvale Lane, squeezed between a real estate office and a bank. It’s very short; only three houses face it, though it does have access to a private parking lo behind the real estate office. I’ve talked about it in FNY before, along with its partner in dead-endhood, Cornell Lane, a bit further west on Northern, and I included just about all the details I can muster on these two little-known passages there. The city’s Department of Transportation for a decade now has been on a street-sign replacement kick, making new ones in upper and lower case which is supposedly easier for motorists to read. 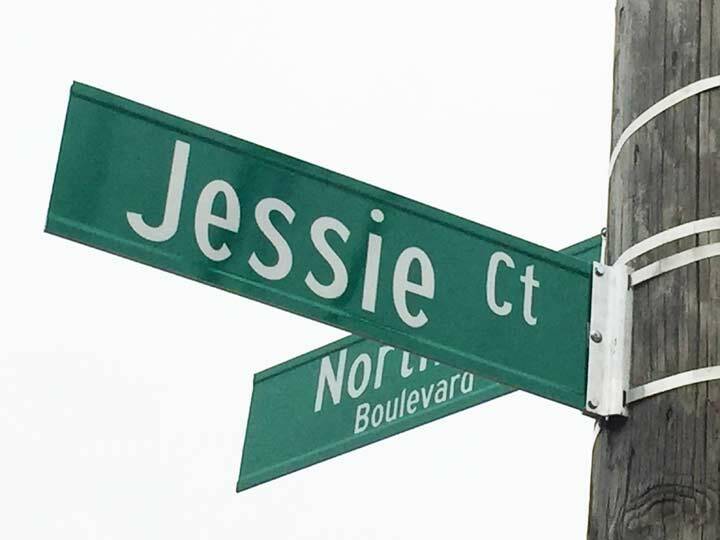 For the first time, at least since I moved to Little Neck in 2007, Jessie Court has an official sign of its very own; it had had an “amateur” sign on the telephone pole, but it vanished after a few months. Now if the DOT could deign to add signs on Little Neck’s Street With Three Names! What a fantastic site you have! I pass those two streets every day and I often wonder what they looked like many years ago, before the merge of all the modern businesses nearby, that is, if they looked like residential streets or entrances. By the way, in that same area, there is another street that does not seem to have a name, but is listed with a sign as a private street. This street is on the Southern side of Northern Boulevard at 251 street, bearly off of and paralleling Northern Boulevard, and has about three houses attached to it. 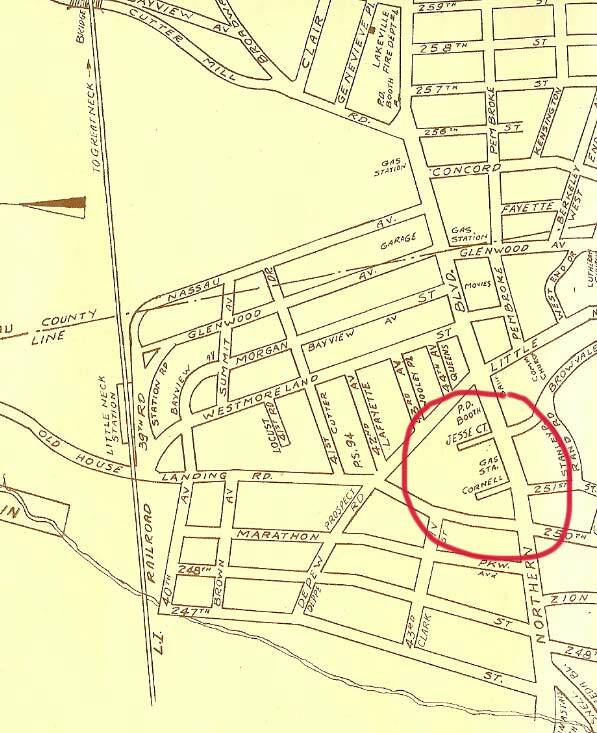 To me, in seems like in might have been the original Northern Boulevard, because if you imaging that it would to continue straight, it would end up where Northern Boulevard does at the area of Great Neck Road? Any information about this street? Thank you for all your fantastic work. Are you talking about the Cornell Lane in your article or a different street. Maybe they have the same name, but the street I am talking about is on the Southern side of Northern Boulevard shooting off 251st street. There is no google map for It, but you can see it from the street view on the east side of 251st street, right before the first house. The Cornell Lane in the article is shooting off from the north of Northern Boulevard, but from Northern Boulevard directly. Thank you for your response. And, nope! Gaskell Rd is a real and regular street and is on the map. This private street is only about 200 feet off of Northern from 251st Street. 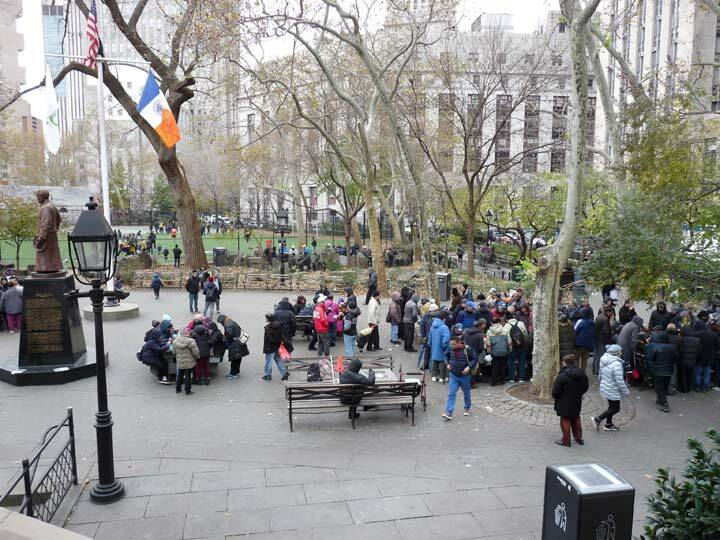 The next time you are in the area, just walk down a tiny bit south on 251st street and you shall see it on the left. Or, go to the street view of Google Maps from Northern and 251st street. My guess is also that it is a private driveway, most likely for a business. I took a look at http://www.historicaerials.com, and going back to the 1960’s I could not see any different alignment for the driveway (no suggestion it was part of Northern Blvd.) – Looking at topographical maps back to the late 19th century I can see that Northern Blvd. was already in place, in its current alignment. Gaskell Rd, Brownvale Ln, and 251st Street do not appear until post-WWII (earliest I saw was 1947, and they pop up together – most likely the entire neighborhood off Northern Blvd. was built during this time). Many of the homes appear to be of this age, some appear slightly older (1930’s? ), so it’s possible there were small dirt roads/dead ends in place prior to being officially recognized on the map. Hope this insight helps. I’m not familiar with this area of NY, but I do extensive research in Massachusetts similar to this. Hi Joel! Would you by chance be related to The late beloved actor Jonathan Frid? The map has an interesting feature. “Marathon Parkway” is where 249th St. is today (only four blocks in length) and today’s Marathon Parkway is shown as 250th St. Mistake? Or were the names exchanged at some point? According to the Alley Pond Center, the area between Cornell and Jessie along the sidewalk and part of Northern Boulevard was a Matinecock Indian burial site. After Thomas Hicks of the much later Hicksville founders killed the last remaining Matinecock, the town continued to grow. As Northern Blvd was a major conduit, the graves were removed to make way for a wider 25A we see today. The put all the bones they dug up in a single grave over at the church which is now marked, “Last of the Matinecock”. A lot of history on that inconspicuous little Jessie Lane. The ‘road’ that you are referring to is a private driveway to access the homes on that corner lot. It is the last link to the days when much of Northern Blvd. from Flushing to the City Line had private homes on it. This property is still privately owned by one family and a true piece of forgotten NY. Thank you everyone for your response. The last explanation, by Anonymous, really explains much, being that the last sentence. I would be curious who that family is. And, BTW, Nirmal Singh, I have been asked that question many times, but no relation!. Frid is pronounces Fried. In Europe, Frid and Fryd are the some (Polish or Russian, depending on who ran the country, and the German spelling was Fried.